Three replacement springs for the medium and small chicken feeder. 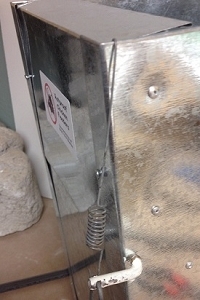 Springs are a wear item and will eventually break although they last longer if the spring is adjusted to reduce excessive closing pressure. Use two pairs of pliers and gently stretch the spring until you have about three pounds force required to push the door open by pushing directly on the door or treadle. The springs are mailed in an envelope via U.S. Mail and the shipping charge is included in the $6.00 sell prince for three springs. The video shows how to install the spring. Always adjust the spring once it is installed by using two pairs of pliers to carefully stretch the spring till the resistance fits the average size of your birds. Too stiff and it closes hard and louder than needed. Stretch it too far and a really big rat can push the door open. 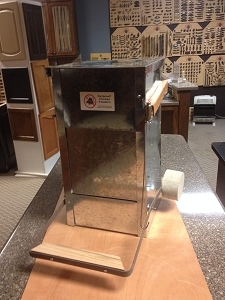 We recommend taping extra springs up under the lid of the feeder so they don't get lost. Happy that these springs lasted for ~3 yrs outside! Spring that came with feeder wore out within a year. 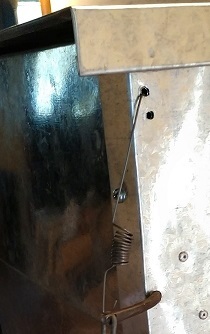 Spring from hardware store did not quite fit and the mice got into feeder. These replacement springs did the trick. We have 3 feeders we bought a couple years ago and they work great! My husband put them together, but couldn’t figure out where the springs went so just tossed them. Well at the time we didn’t have any rat issues, but just a couple months ago rats started eating all our chicken food and I couldn’t figure out why this feeder wasn’t rat proof until I went and looked at the feeder and compared it with a YouTube video and found they we didn’t have these Springs on it. Long story short, the Springs definitely make it fat proof because the rats aren’t able to push the door open anymore and get the food. Don’t throw the Springs away, the chickens will eventually learned how to open the feeder.